The Stars have figured out a winning formula, it seems: allow the first goal and then shut the door. After allowing a shorthanded goal seven minutes into the first, Texas shutout Peoria the rest of the way while scoring four of their own. Rookie Reilly Smith added his fourth and fifth of the year and Matt Fraser had his eighth and ninth. Cristopher Nilstorp had another dominant performance, stopping 23 of 24 and showing strong resilience after getting a stick to the neck in the second period. The game started out on a pugilistic note. 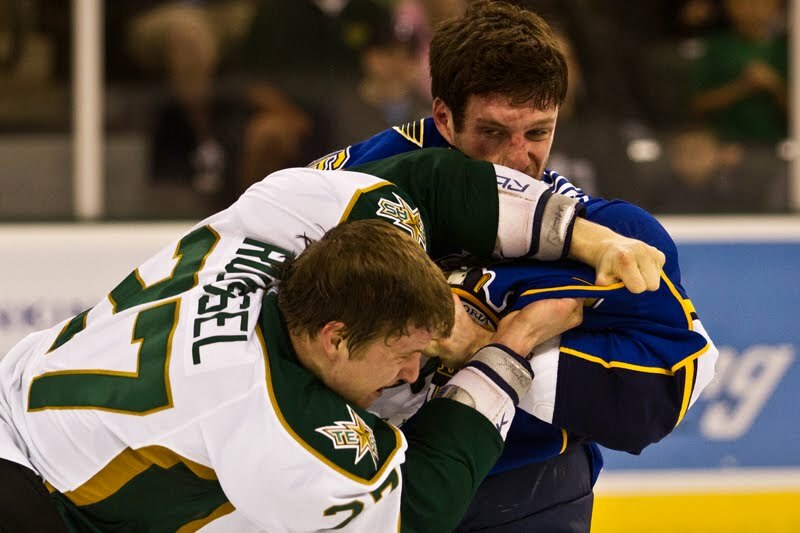 In the first six minutes, Texas forwards Mike Hedden, Antoine Roussel and Francis Wathier all dropped the gloves with Peoria. "They tried to take over by playing a physical game," said Reilly Smith. "There's a lot of guys on our team that really stood up and turned the game around for us. I think that was the big catalyst." Coach Desjardins was surprised by the physicality of the Rivermen after their play in Peoria. "We played physical back and made it a wash," he added. The Stars allowed the first one shorthanded to first-round pick Jaden Schwartz. The backhand over a sprawled Nilstorp was the first shorthanded goal against for the Stars this season. "The first one was tough," said Smith. "I was upset because we should never do that on a power play." The Stars answered right back at even strength with Reilly Smith collecting a rebound and tucking it just inside the left post from behind the goal line. 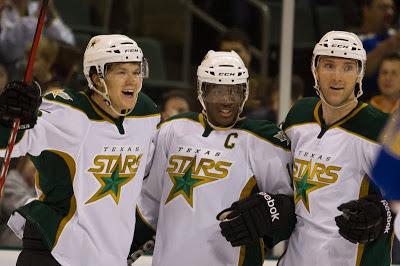 Cody Eakin and Maxime Fortunus assisted on the play. The Stars carried that lead to the first intermission, leading in shots 13-9. Texas dominated the rest of the way in shots and goal. Matt Fraser scored back-to-back goals in the second period, both at even strength. Fraser entombed a one-timer into a yawning net off the pass from Travis Morin to make it 2-1 at the four minute mark. Four minute later, Fraser roofed a rebound puck off the initial shot of the same Morin. It was his ninth goal of the year and made for his third multigoal game of the season. The Stars outshot the Rivs 17-7 in the period and kept pouring it on. "[Lots of shots] is the plan every night. No shot's a bad shot," said Smith. Toward the end of the period, Anthony Peluso got his stick up under the cage of Cristopher Nilstorp, jabbing him in the neck. Nilstorp went down for an extended period but no penalty was called. "It's a tough call if the ref didn't see it," said Desjardins. "I don't want a ref to make a call he didn't see." Nilstorp was really giving it to the Peoria bench after getting back on his feet. He rode that competitive fire into the third period to continue shutting down Peoria shooters. Texas added one more in the final period, off the stick of Reilly Smith again. Up two men on the ice, Texas scored on the rebound just before the first penalty expired. "We felt if we could get one there it would put the game out of reach." Texas has some time to rest up their legs now with a five-day layoff before facing Abbotsford for back-to-back games next Friday and Saturday in BC. Glennie out "for a little bit" with a hand injury. Alex Chiasson blocked a shot in the third period and had to be helped off the ice. He was not putting weight on his right leg. The puck may have hit just above the shin pads and just below the breezers, which is a vulnerable spot.